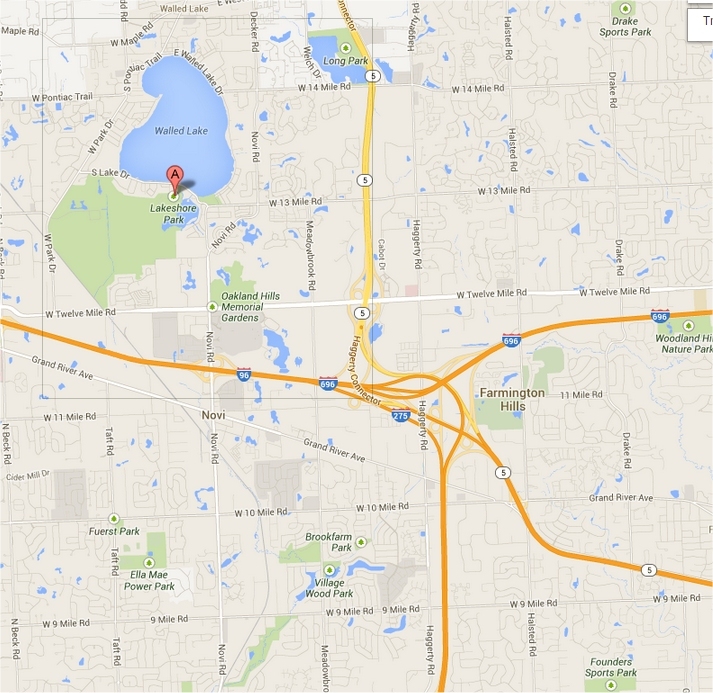 Lakeshore Park is a very neat park nestled along side the lake Walled Lake in Novi MI. I drove right by this park for years heading to the Bayside Sports Grille and didn't even know it was there until reading about the park online rcently. By the way, the Bayside Sports Grille located on the north tip of Walled Lake is a fanstic place to eat with good good, outdoor seating and a perfect view of Walled Lake. There is also paved a walking trail right there you can use to walk around the lake with a beach right next to the grille. Lakeshore Park's mountain bike trail is approximately 10 miles long and covers a variety of terrain for both the intermediate and experienced rider. In addition to the more challenging mountain bike trail, Lakeshore Park also contains an extensive network of wider trails suited to walking, family biking, and cross-country skiing. The bike trail is dirt and wide enough for anyone to bike. You'll be amazed at the "up north" feeling you get in these trails. And I loved all the pine trees. There are plenty of maps throughout the trails which you need as its like maze back there! The park also has a summer camp for kids with activities and fields trips such as: water olumpics at the Red Oaks Wave Pool, Animal Safari at the Detroit Zoo, Mad Science at the Detroit Science Center, Back the Future at the Ann Arbor Hands on Musuem, and Nature Exploration at Kensington Metro Park to name a few. Enjoy! Crazy YouTube video of guy biking the Crater Log at Lakeshore Park - wow!